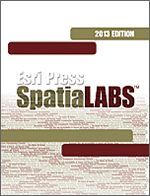 Installed from a DVD, SpatiaLABS from Esri Press are designed to supplement college coursework with computer lab activities that enhance spatial reasoning and analysis skills in students. Across an entire campus, educators decrease the time spent preparing materials for their course with this packaged solution. Additionally, students are offered a platform to see real-world applications of the concepts and skills they are studying in their art and science classes through the use of mapping technology and visualization tools, including Esri's ArcGIS software.